Panchakarma is a cleansing and rejuvenation plan used in Ayurveda, a form of alternative medicine practiced in India. It was developed for royalty in India to prolong life and health by removing physical impurities, bringing awareness to destructive thoughts and behaviors, and releasing old patterns. Panchakarma is typically done once a year for disease prevention and emotional and spiritual growth and it's divided into three phases. You can do it at home or at a treatment center. The goal of purva karma is to prepare your body tissues for the cleanse and release of toxins. One to three weeks before the actual cleansing phase, all processed foods, sweets, stimulants such as coffee, and most dairy products are eliminated from your diet. One week before the cleansing phase, your diet is further modified to predominantly vegetables and whole grains. According to Ayurvedic practitioners, these foods, particularly the vegetables, create a more alkaline environment in your body, which supports the cleansing and detox process. During this preparation phase, your activity will need to shift to become more internally-focused. This means letting go of some day-to-day activities and spending time meditating and taking walks in nature. Deep breathing, focused on the exhalation phase, helps to rid your body of old ideas, emotions, and blockages. Heat ghee (clarified butter; see recipe below) or olive oil in a pan over moderate heat. Add cumin or coriander seeds, then add 1 medium onion, finely chopped, chopped ginger, and garlic and saute until golden brown. Stir in 1 teaspoon of turmeric powder, 1/4 tsp. of black pepper powder, and 1 bay leaf. Add mung beans, water, vegetables, and rice. Cook for about an hour. When the beans are completely soft, add a pinch of salt. Serve this dish with ghee and chopped fresh coriander leaves. Ghee is made by placing unsalted butter in a pan and letting it melt and simmer on very low heat. The butter may look cloudy and there may be foam at the top. In the first five minutes, stir the butter occasionally. Leave the butter to continue simmering for another 15 minutes. You will see the particles sink to the bottom of the pan and foam will settle at the top. As soon as the sediment at the bottom starts to brown, remove the pan from the heat. Skim off and discard the foam. Strain the liquid through a fine sieve or muslin into a glass jar. Originally, this phase consisted of five practices: nasal cleansing, enemas, laxatives, emesis (vomiting), and blood-letting. 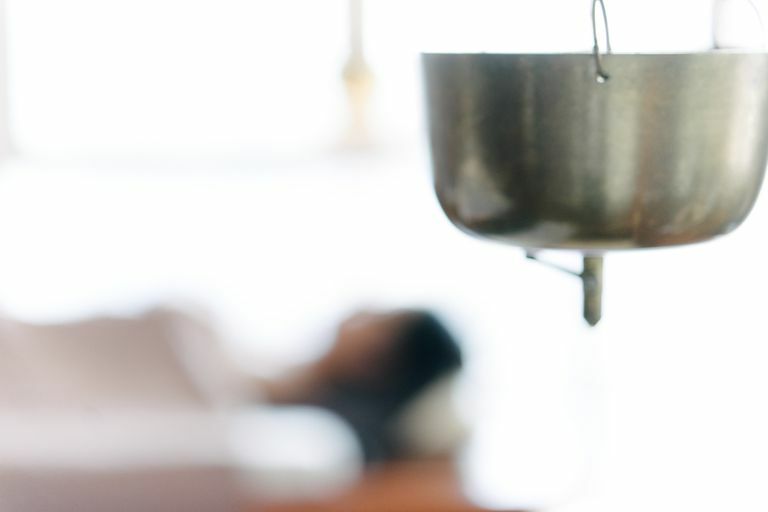 Although the five practices may still be followed in certain parts of India, in North America the practice of emesis and blood-letting is considered unnecessary and unsafe by most alternative medicine practitioners. A fasting herbal drink is taken throughout the day (see recipe below). Have 1-2 teaspoons of ghee with hot water in the morning on an empty stomach. This is believed to release toxins. Apply ghee to the temples and soles of the feet before bed. This helps to calm the mind and promote sleep. 1 teaspoon of psyllium fiber in a glass of water. Take 2 times per day. Simmer for 5 minutes, then remove from heat and keep covered for another 15-20 minutes. Strain through a sieve and drink it warm throughout the day. On day 1 and day 2 of the rejuvenation phase, begin eating khichadi but change the proportion of water in the recipe to 14 parts water to 1 part rice, 1 part beans, and 1 part vegetables. On day 3, follow the original recipe. Many people find that the most profound healing occurs during the rejuvenation phase. Physical, emotional, and spiritual changes may be experienced in the days and weeks to come. Sometimes issues that have been suppressed will surface. There are all sorts of online panchakarma programs to try at home, as well as treatment centers to go to. Due to a lack of research, panchakarma cannot be recommended as a treatment for any condition. Also keep in mind that it may not be safe for certain people, including those with medical conditions or who are taking medications. Pregnant or nursing women and children should not try panchakarma. If you're considering trying panchakarma, talk with your primary care provider first. Keep in mind that alternative medicine should not be used as a substitute for standard care in the treatment of any health condition. Should You Buy the Grid Foam Roller?